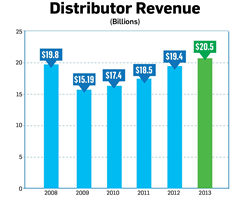 The promotional products industry reports record-breaking sales for 2013 along with 16 straight quarters of growth. Sales of promo products, aka ad specialties, hit a record-breaking $20.5 billion in 2013. “It’s clear the entrepreneurs and small business owners at the heart of the promotional products industry are bullish on ad specialties and more optimistic than ever,” said ASI CEO Timothy M. Andrews. The Advertising Specialty Institute® (ASI) today released its annual sales analysis for the promotional products industry, showing total sales of $20.5 billion for 2013, up 5.3% from 2012, with continued strong sales forecast throughout 2014. Leading research firm eMarketer’s estimates for media spend by category suggests total distributor sales of $20.5 billion puts promotional products third among all advertising media, behind TV and digital, the same ranking as 2012, when sales were $19.4 billion. The U.S. Department of Commerce reports that real GDP – which measures output produced in the U.S. –grew at an annual rate of 2.6% in the fourth quarter of 2013. Averaged across the four quarters of last year, real GDP added 1.9% in 2013 from 2012. Economists predict the U.S. economy will grow by 3% in 2014, the fastest rate of expansion since 2005. By contrast, the promotional products industry was up 5.3% from 2012 to 2013. To learn more about ASI research and sales analysis, contact Nathaniel Kucsma, ASI’s director of marketing research, at nkucsma(at)asicentral(dot)com.